Shet-shimul or Kapok (ceiba pentandra, family: bombacaceae) is a tall deciduous tree, up to 30 m high, with fast-growing branches. Trunk is straight, prickly and greenish when young. The tree's trunk is so strong that it often covers a wide area. The original home of the plant is Central America. Other names: White silk cotton tree, Java cotton, Silk cotton. Leaves are alternate, compound, digitately arranged; leaflets 5-8 entire, blade 10-12 cm long, lanceolate, shortly petioled. Flowers are creamy white, 2.5 cm across, petals 5, borne on numerous axillary clusters near the end of branches. Fruit is a capsule, ovoid, oblong, green when raw, grey when ripe, 7-12 cm long, 5-valved, many-seeded. Flowering occurs from January-March along with the emergence of new leaves. Leaf, bark, fruit, flower, root and adhesive are used to prepare medicines for strangury, physical weakness and bloody catamenia. The plant produces cotton like Shimul. Its timber is light and used to make stick band toys. Propagation is caused by seed and large cutting. 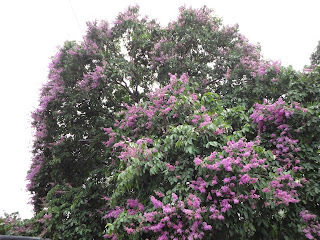 As an ornamental tree, it is found in parks and gardens in Bangladesh.